On my last brunch post, I talked about inspiration from eating out. I love it when we enjoy something at a restaurant that I can easily recreate at home. This time, it's a simple berry compote, served warm with Belgian waffles, inspired by a menu item from the restaurant, Balthazar, in NYC. Ever since I got my waffle maker, we have waffles pretty often for weekend breakfast. I mix it up between several recipes and these Belgian waffles, adapted from The Pioneer Woman, is one of those on our rotation. Folding whipped egg whites into the batter helps make the waffles crisp and we really like their simple sweet, vanilla flavor. Usually, we reach for maple syrup but I thought I'd change it up and make a berry compote, much like what we had at Balthazar a few months ago. 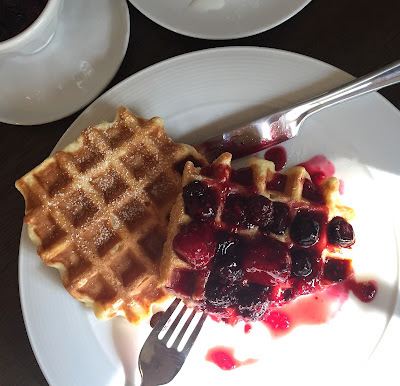 It's often the little things, small touches, that make something special and so, sometimes it's nice to take an extra step like making a berry compote to go with your waffles. While fresh berries are a great option right now, I used frozen mixed berries so that I could have a mix of strawberries, raspberries, blueberries, as well as blackberries in this little compote. It's so convenient and literally takes just minutes to make. Into a pot, I simply added frozen mixed berries that I thawed the night before (you can use fresh berries, of course), along with some orange zest, sugar, and if you like, a splash of Grand Marnier. I love the hint of orange flavor in the background. It just takes a few minutes to heat up the mixture and melt the sugar. In the last minute of cooking, stir in a little cornstarch slurry to thicken the liquid...and your berry compote is ready for breakfast! It's easy to scale how much compote you want to make and aside from serving it with waffles, you could certainly use it to go alongside pancakes or French toast. You could layer it with yogurt to make a parfait, or serve it as an accompaniment to a slice of pound cake or something similar. We enjoyed it with the waffles and I made it particularly with my husband in mind. His sweet tooth starts early in the day with a preference for sweet breakfasts. Frankly, he also prefers his fruit with extra sugar. This is right up his alley and a nice treat to enjoy on an occasional weekend morning. Here's to a great week and upcoming weekend! We are racing towards the finish line that is the end of the school year. More importantly, it's the little guy's 12th birthday this Saturday, as well as Father's Day on Sunday. It's always a jam-packed June with those two main events. So I'm looking forward to focusing on the fellas this weekend...and, as usual, food will certainly play a key role! In a small bowl, make a cornstarch slurry by mixing the cornstarch with orange juice or water. Set aside. Place berries into a small saucepan, along with sugar, zest, and Grand Marnier (if using). Heat over medium high heat, gently swirling and lightly stirring on occasion, until mixture comes to a boil and the sugar has dissolved. Add the cornstarch slurry and cook for 1 more minute (do not overcook or fruit will break down too much). Let cool slightly and serve with Belgian waffles (suggested recipe below), pancakes, or French toast. You could also layer it with yogurt for a parfait, or serve it as an accompaniment to a slice of pound cake or something similar. In a large bowl, whisk together the flour, baking powder, salt, and sugar. In a liquid measuring cup, whisk the milk, egg yolk, vanilla, and melted butter together. Pour the liquid ingredients into the dry and whisk until about halfway incorporated. In a separate bowl, whisk the egg whites until stiff. Gently fold the beaten egg whites into the batter, until just barely combined. Ladle batter into your waffle maker and cook until golden brown and crisp. Serve warm with berry compote (recipe above) or with maple syrup. (Optional) Grand Marnier, silly girl! Haha - love this compote and I could eat it on just about anything - including a bowl of Greek yogurt :) It would turn anything into dessert ... even waffles. You always have the most beautiful waffles and I bet my husband would be thrilled if I'd make him some - perhaps Father's Day. Great brunch Monica - stay cool! I thought of you as I was adding that Grand Marnier. I know you would've had been more generous. It is oh-so-good! I was thinking it would pair well with the orange-Grand Marnier French toast I've made, too. Have a great weekend ahead, Tricia!! The berry compote looks so GOOD! You have me crave some waffles for the dinner, Monica. I am a huge fan of just a little orange with berries! These waffles look so good - you're making me want breakfast for dinner! I love breakfast for dinner...I need to do it soon. Thanks, Ashley! I too get inspiration from restaurant and I try to recreate that I love. This berry compote sounds incredible with Belgian waffles, Such a yummy and gorgeous breakfast!! I look for any ways to twist things up just a little for variety. : ) Hope you have a great weekend, Kelly! Yum!! Now I am going to be dreaming about these... And will be seriously disappointed when I wake up in the morning without them. They look SO delicious! Can you believe I don't own a waffle iron?!? I seriously need to buy one, this looks so good! I only got one a year or so ago! We "waffled" on it for a while but I'm so happy I got it! I used to work in a waffle cafe years ago when I was still in school... the tones of waffles with cherry compote that I ate... I don't have them very often nowadays, but when I do they are always a delight. I love that compote you've made, it looks so glossy and delicious. Loving the addition of the grand Marnier! What a fun twist on a berry compote! This would make one fabulous brunch! Hello Monica! Sweetie Grand Marnier should never be optional.... Hahaha... I’m fond of it (love Cointreau, too). Okay, I need to amend the instructions so that orange liqueur is a must! ; ) It's been crazy busy here...hope things are quieting down for you. Let's start enjoying summer! This is a great way to start your day! I won't lie that I love Belgian waffles the most, because I love truffles more. ;) But yeah I have to admit that I am a happiest girl when I start my day with waffles. So, these waffles are calling my name. And that way, I would be able to use my waffle maker. I am super glad I got my waffle maker. It's great to put it to use and enjoy the fruit of your labor at home. Hi Wendy - yes, so many things you can do with a fruit compote. It's easy to make and a nice treat. We had a busy weekend! Father's Day and my son's birthday are always crammed together and I really want to give each its time in the spotlight. : ) I think we managed. I seriously cannot believe the "kid" is 12! I don't know how it happened but I remember those toddler days like it was yesterday...I'm sure you can relate. Your husband sure has great taste! Who can beat good old waffles and a delicious berry compote. So delicious! He loves fruit desserts and just fruit, sweetened, in general! haha. Thank you!